Welcome to our surgery website where we hope you will quickly benefit from a user friendly layout and a wealth of information about our healthcare services. We provide a comprehensive medical service to residents of Driffield and its surrounding villages from two surgeries. Our main surgery is situated in the middle of Driffield and is located within a new, purpose-built modern building . We also have a branch surgery situated at 22a High Street, Nafferton which primarily serves the people living there. We are happy to see our patients at either of our surgeries during opening hours. Following our recent survey (held on Facebook and within the surgery) within which we asked patients what their preferences were for accessing appointments, we are pleased to advise that changes to the system will start on Monday 28 January 2019. We are pleased to advise that we will re-introduce the ability to pre-book an appointment with a GP. This is so GPs can concentrate on more complex illness and/or appropriate following up of a patient. On the day contacts will initially be 'care navigated' by our reception team. If an appointment is needed, the majority of our patients who are wanting an appointment that day for an acute illness will be given an appointment with our Advanced Nurse Practitioners. As a result of the above, we will no longer be able to provide the volume of telephone contacts we have done over the last couple of years as the GPs will all be busy in their booked surgeries with very little flexibility for work outside of those booked appointments. We hope this will improve continuity of care for our patients, especially for those with complex needs. Please be patient with us whilst we get this new system embedded over the next few weeks. There are no changes to how you access practice nurse and healthcare assistant appointments. This is a message for all the patients that we dispense medication to (you need to live more than 1.8 km from the nearest pharmacy (as the crow flies)). We are aware that there are some online pharmacies marketing aggressively in our area. The decision where you have your medicines dispensed is up to you. However, we need to ensure you are aware that, if you choose to use an alternative provider to us, you cannot change your mind and come back to the practice to have your medicines dispensed in the future. Unfortunately the rather archaic regulations do not allow this. We want to continue to provide you with a dispensing service but if you do choose to leave us, please ensure you are aware of all the facts. We are pleased to announce that Dr Natalie Martin started with the practice in January 2019. Please ring 111 if you need a doctor urgently during this time. To ensure patient safety and manage demand, please note we require 3 working days to process repeat prescriptions. We have changed the provider for our electronic consultation access. 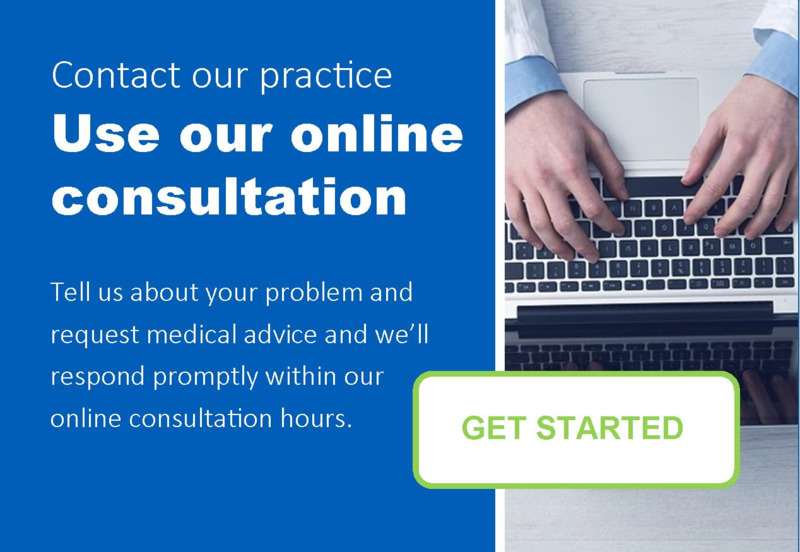 Please click on the icon below if you wish to use Engage Consult to send an electronic consultation to the practice. PLEASE NOTE: ENGAGE CONSULT HAS BEEN UPDATED. UNTIL FURTHER NOTICE, IN ORDER TO SUBMIT YOUR ENGAGE CONSULT PLEASE CLICK ON THE ICON BELOW FOLLOWED BY ONE OF THE OPTIONS AVAILABLE. YOU WILL THEN NEED TO CLICK 'CONTINUE AS GUEST USER' TO BEGIN SUBMITTING YOUR ENGAGE CONSULT. A number of our patients are commenting that we are not calling them back when they use this service. The practice is not notified if you choose to use this service. It is a BT service which is managed at the BT exchange when all lines are busy. If you choose to use this service the BT network will monitor your call for 45 minutes and then ring you automatically when a line becomes available. You are charged by BT for this call. We cannot influence how well this will work and the operation of this is totally outside of the practice's control. If you are dissatisfied with the service, you will need to contact BT directly. PLEASE NOTE THE ABOVE IS SUBJECT TO CHANGE BUT IS CORRECT AT TIME OF PRINT. All practices are required to offer this test to our patients. It is very brief and asks only 2 questions. We would be very grateful if you could take the time to please click the link on the right of this page (Friend & Family Test) and complete the test. We record all of our telephone calls (incoming and outgoing) for quality and training purposes. Unless a patient has “opted out” (declined), The Park Surgery patients have their Summary Care Record held on the NHS national computer system. A Summary Care Record is an electronic record which contains information about the medicines you take, allergies you suffer from and any bad reactions to medicines you have had. Having this information stored in one place makes it easier for healthcare staff to treat you in an emergency, or when your GP practice is closed. Only healthcare staff involved in your care can see your Summary Care Record. The GP2GP facility enables the electronic transfer of patient records between practices. This means that your records will be available to your new GP much quicker than previously. The Park Surgery already use this facility. You may (or may not) be aware that general practice is contractually obliged to give patients access to a summary of their medical record, access to online appointments and the ability to order repeat medication online. From April 2016 we are also contractually obliged to give patients to all of their coded data which is held on the their medical record. You can view your medical problems, medications, allergies, test results and vaccination records online. However we need to ensure that we have appropriate mechanisms in place to be certain that we only give access to this information to the person it relates to. We are sure you can appreciate that it is vital that we follow the strictest security procedures! Therefore, if you wish to view your medical record online, please ask reception for the relevant form which you need to complete. You will also need to show appropriate ID so that the member of staff is absolutely certain it is the correct person requesting access. Once this process is complete, we will ensure that you can view your summary medical record online. Please note, this process applies even if you are already registered to use our online access to appointments and repeat medicines (as it is likely that you were not asked for ID verification at the time of registration). If you have any queries about the medical information you see, please put in writing to us your concerns so that a GP can check the details. We welcome back our medical students who are studying for their medical degrees at the Hull & York Medical School. The practice has a strong belief in the value of training the future generation and we welcome your support in assisting us with this. We try to make our service available to all patients regardless of disability or other special need. If you have a special need which makes it difficult for you to make the best of our services, please let us know. We will do whatever we can to make things easier. The Park Surgery is a purpose built, modern property and has automatic doors from both the street and the car park. There are a number of dedicated disabled parking places and a lift inside the building as we do have consulting rooms on the first floor. At the Nafferton surgery, our disabled patients are able to access the surgery entrance from the rear car park, rather than from the High Street. The practice is required by the Government under the terms of the latest GP contract to allocate all patients a named accountable GP. Individual patients will be informed of their named accountable GP at the first appropriate interaction with the practice. All current and new patients registered with this Practice will be allocated a named GP. If you would like to express a preference as to which GP you are assigned the Practice will make reasonable efforts to accommodate this request. Your accountable GP is responsible for your overall care at the Practice, however you are welcome to see any GP within the Practice. If you would like to know the name of your accountable GP please ask at the Reception desk.